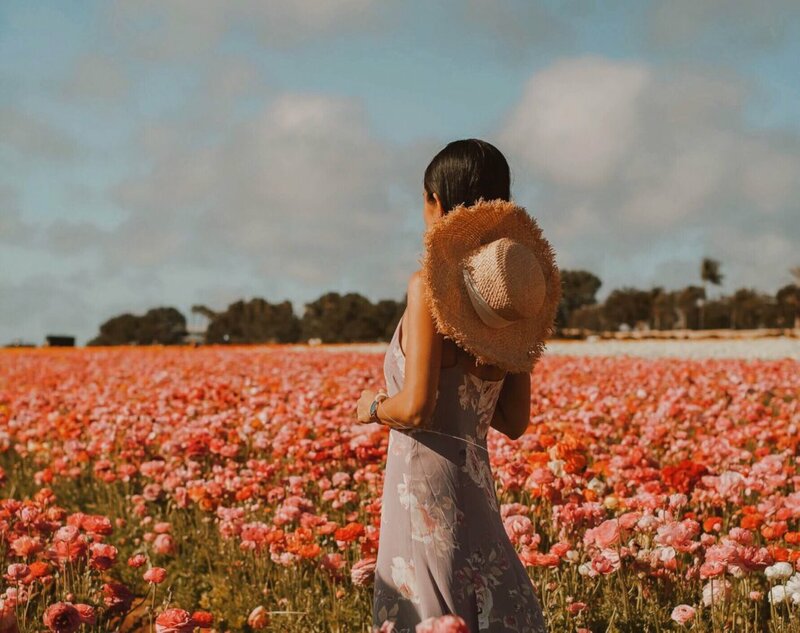 From March 1 to May 12, The Flower Fields at Carlsbad Ranch boasts nearly 50 acres of Giant Tecolote Ranunculus flowers. At The Flower Fields, the Tecolote Giant Ranunculus is king, with the majority of the land dedicated to growing the ranunculus bulb crop. 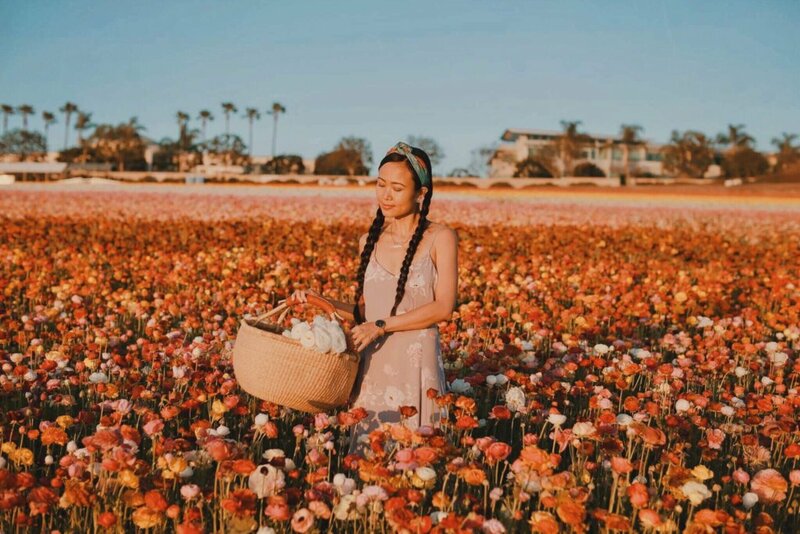 Overlooking the Pacific Ocean, the flowers transform the rolling hills of North San Diego County into a spectacular display of color and beauty every spring. 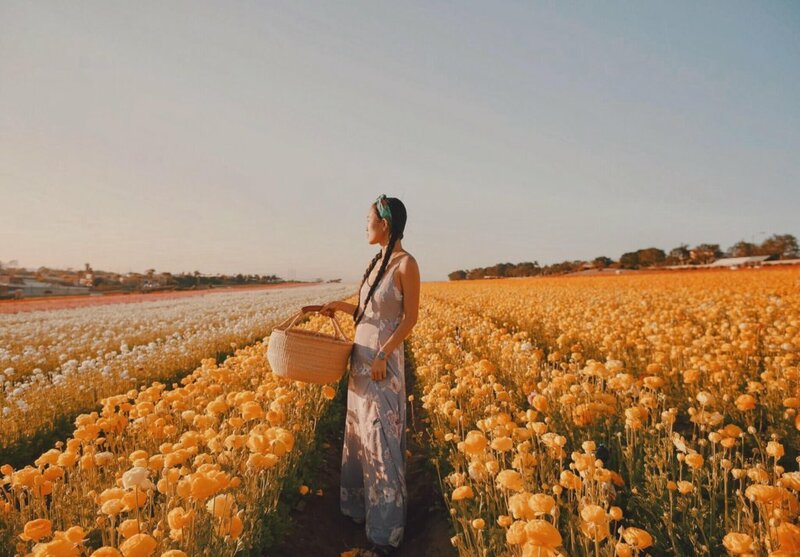 The Flower Fields is considered by many to be the most spectacular farm of its kind in the whole country. But that’s not all this floral wonderland offers. There is a variety of events The Flower Fields hosts throughout the season. 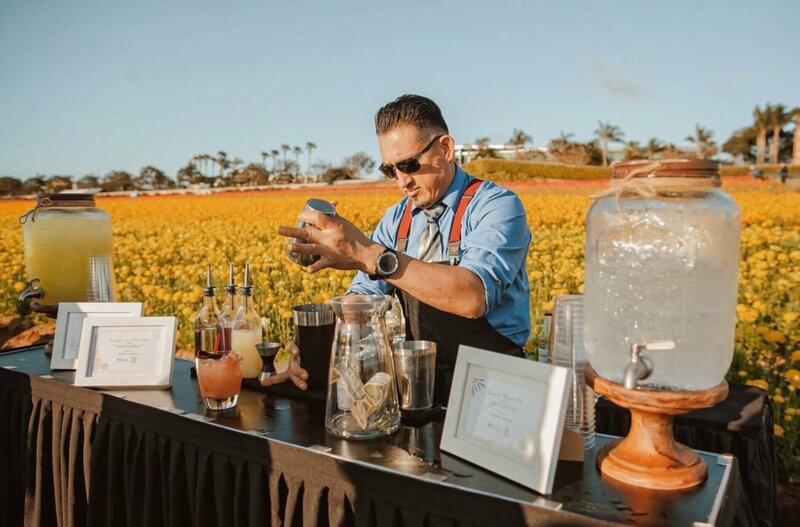 Events cover all kinds of interests, from arts and crafts to food trucks galore; live music to after-hours wine tasting; a picnic in the flowers to tea in the garden. And I’m so lucky to be invited by their media team to attend their petal-to-plate picnic this year! 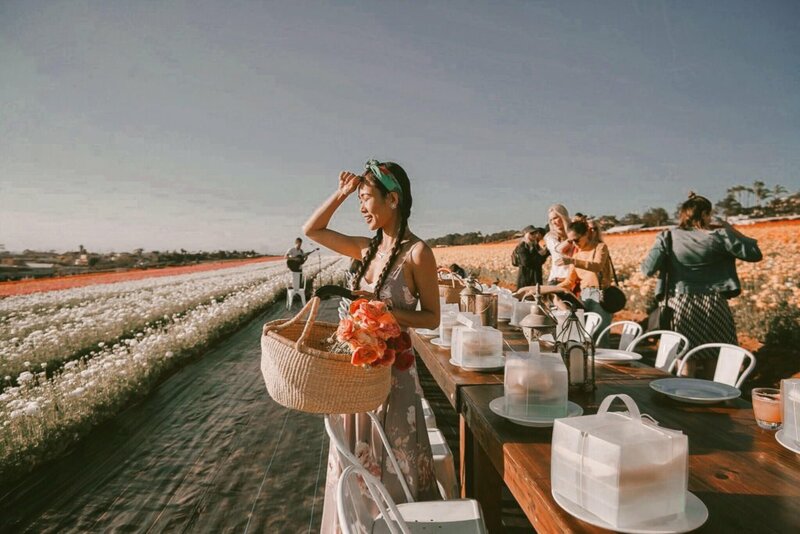 The Flower Fields ambiance sets the perfect outdoor backdrop for a romantic picnic nestled among the flowers. This is any picnic lover’s paradise. 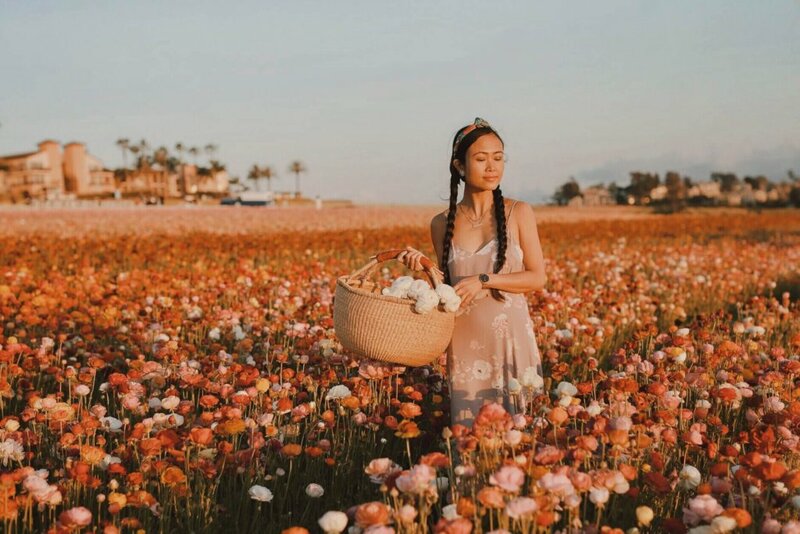 When you take a seat among the exquisite fields of America’s most stunning flower farms, you’ll make a personal connection with these flowers. Our picnic was set in the middle of the colorful splendor of field-grown flowers. The setting became even more spectacular around sunset. It’s an incredible experience to enjoy a gorgeous warm California coast sunset with gentle breezes while picnicking. 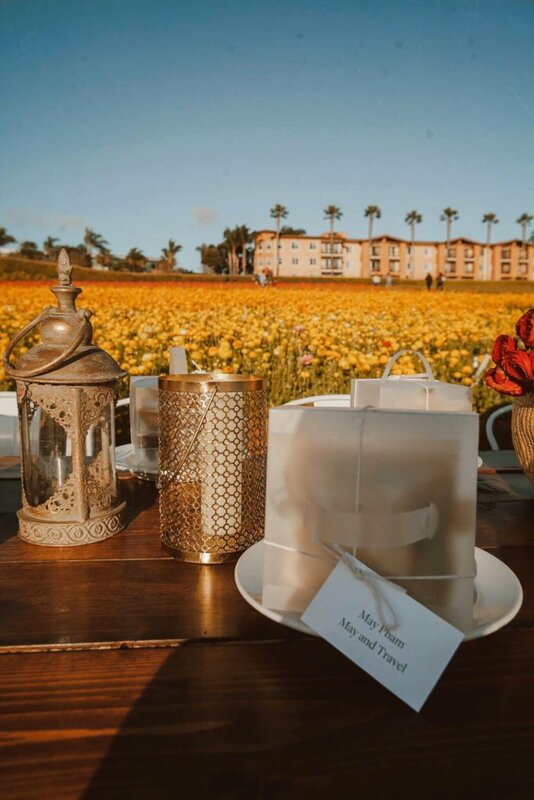 As you sit around the table and enjoy these bountiful baskets of amazing cheese or crudités and sandwiches plus dessert provided by the The Westin Carlsbad Resort & Spa, all eyes are on the backdrop of thousands of blooming, bold Tecolote Giant Ranunculus flowers! 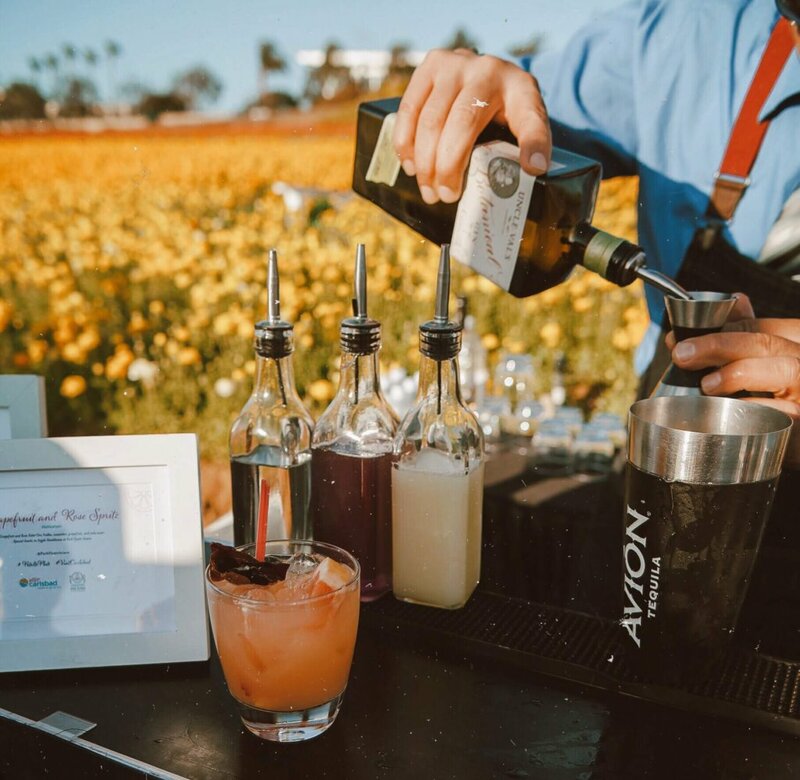 One of the highlights of this picnic is guests are able to sample the delights of spring with floral-inspired creations from participating resorts, bars, restaurants, and breweries. 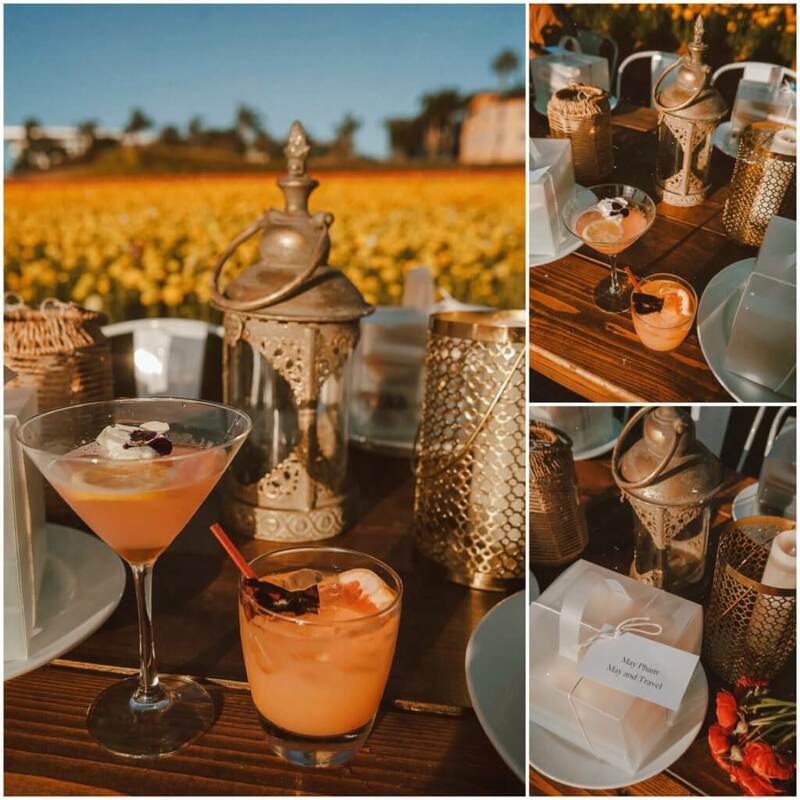 These participating venues incorporated floral ingredients from hibiscus, lavender, orange blossom, marigold, poppy, rose, lavender, and orchid to delight the senses and awaken your tastebud. And may I say, the floral cocktails prepared by the participating venues at this event are top notch. Our favorite cocktails are Grapefruit and Rose Spritz by Park Hyatt Aviara with Rose Vodka, Cucumber, Grapefruit, and Soda Water and Flower Child cocktail by Park 101 with botanical gin, lavender, honey, fresh lemon, and grapefruit bitters. 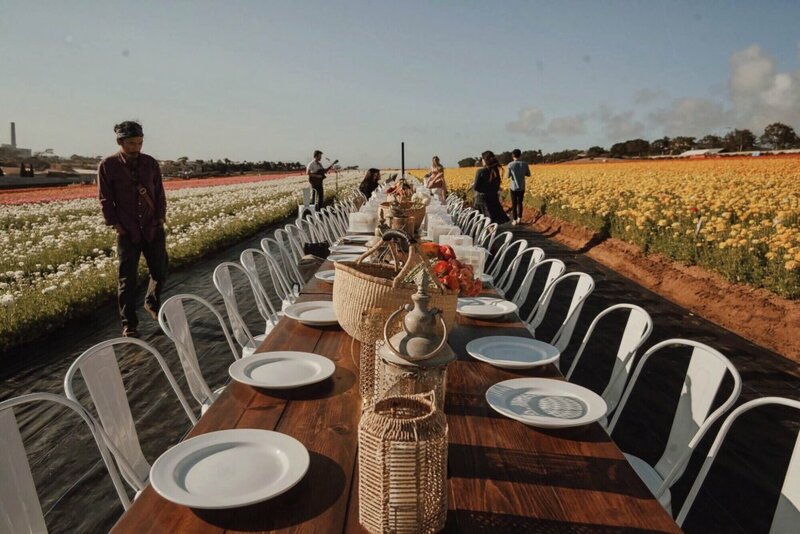 Along with enjoying a meal while overlooking the colorful fields and views of the Pacific Ocean beyond, guests also had lively conversation among dinner companions who share the same passion about events like this that celebrate and raise awareness of sustainably and locally grown flowers. 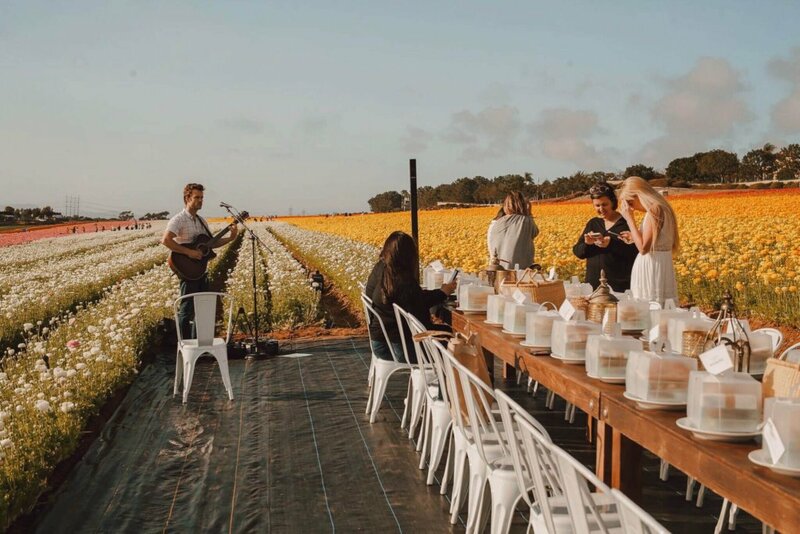 These are dreamy meals served in a field full of flowers. We enjoyed music as the sun disappears over the ocean signaling another perfect night capped with a picnic overlooking the flowers. What a lovely evening of flowers, food, friendship — and a focus on local flower farming in our community. Timed with the blooming of The Flower Fields at Carlsbad Ranch, Carlsbad celebrates its vibrant floral surroundings with a new annual edition of “Petal to Plate by Visit Carlsbad.” The 10-day celebration of fine flowers, food, and drink in the charming coastal Southern California town will take place from April 4 to April 14, 2019 and includes events and floral-inspired specials at venues across the city. Check out their full calendars here. 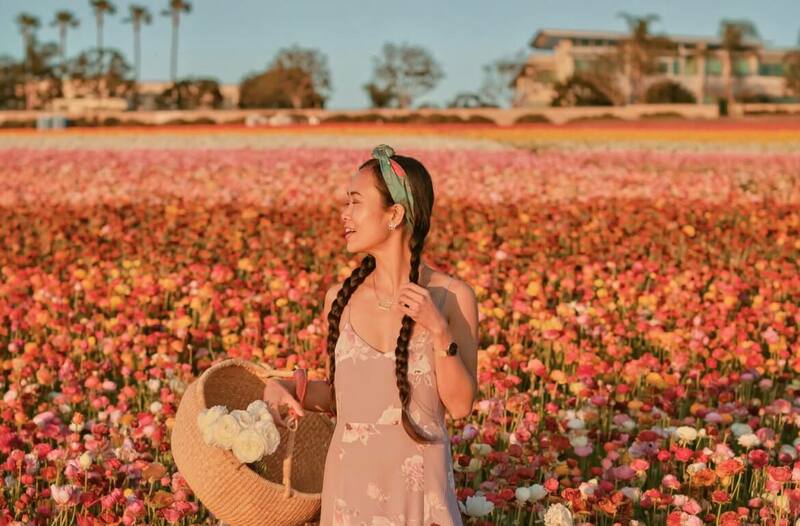 ***Thank you to Visit Carlsbad and The Flowers Field for kindly sponsoring this post. All opinions are 100% honest & completely my own.